If you are not living under a rock, and by rock I mean a major rock, you know by now that #Nickyanka have gotten engaged. Nick Jonas proposed to his lady love on her B’day and she of-course said YES! But seems like our ‘Desi Girl’ is not letting her Indian rituals aside as she and Nick got Rokafied this morning! You know he’s arrived in Mumbai right? 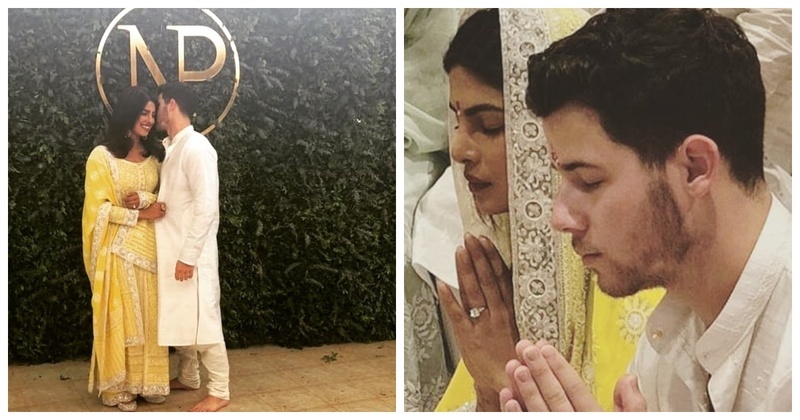 Before exchanging rings today officially, the love-birds attended a Puja at Priyanka Chopra’s Juhu Bungalow. Can they be anymore adorable? ...and that’s mama and papa Jonas in chikankari outfits. Can this be any cuter? Looking stunning a lemon yellow Abu Jani Sandeep Khosla with silver beaded work, the bride-to-be looked her radiant self! Just last night these two love birds were spotted enjoying their pre-engagement dinner at JW Marriot with their respective families and looked just perfect. Also, Mrs-Jonas-to-be couldn’t stop flashing her rock and here’s saying it was blinding girl! Ahhh, I can’t wait for them to be already married. If you wanna know what I think can be expected out of their wedding, give this a read!